'Triune of Troy' built immediately pre-war by A H Moody & Son Ltd is one of what became known as the 'Channel Class' and was completed in 1938 for Lord Russell of Liverpool. The famed design (No.19) from the board of Laurent Giles boasted a graceful sheer, balanced overhangs and a powerful Bermudan cutter rig and was built of Pitch Pine on Oak. Post war, 'Triune' was owned by the writer Hammond Innes for a number of years who then sold her to Sir Charles Evans; the inspired adventurer credited with promoting the use of oxygen in climbing Everest. In more recent times (since 1991) she has been in the diligent ownership of Dr David Knights with good fundamental work carried out as required over the 27 years of his 'watch'. Its now time that this historic classic be passed on to someone with the eye, ability and determination to maintain her in the manner that befits such a capable example of our sailing heritage. 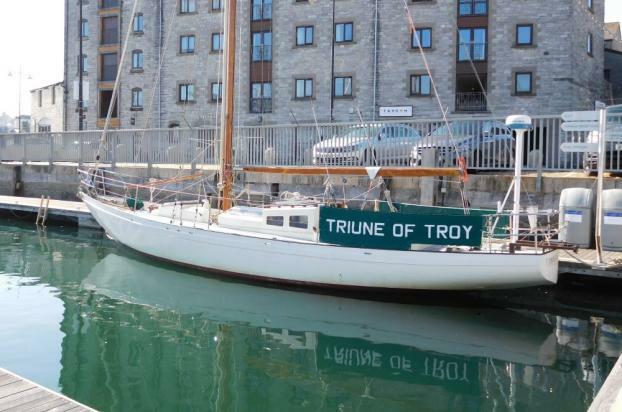 'Triune of Troy' is now berthed very close to our office in Sutton Harbour Marina for easy viewing.